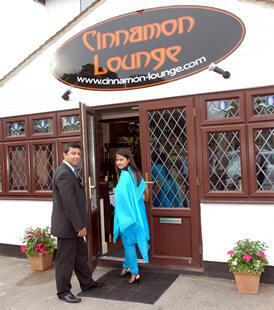 The management are proud to welcome you to Cinnamon Lounge where you will find the finest authentic Bangladeshi and Indian cuisine. Our range of unique speciality dishes is highly recommended and an extensive wine list is available to compliment every meal. A combination of tradition, modernity and mouth-watering dishes makes dining at Cinnamon Lounge a great evening out. The sylish and elegant decor of our restaurants provides a gracious backdrop for every occasion. We hope you enjoy the Cinnamon Lounge experience! To avoid disappointment please make a reservation at the respectice branch. We also cater for private parties. For any comments regarding Cinnamon Lounge please contact zak@cinnamon-lounge.co.uk. Set in a detached building opposite the Napsbury Park arboretum, Cinnamon Lounge, London Colney, has become an extremely popular eatery in the London Colney and surrounding areas. The restaurant has been modernised to the highest standards creating a rich and vibrant atmosphere. 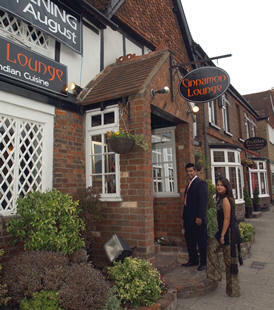 Cinnamon Lounge London Colney has raised the bar for Asian dining in and around St Albans. The menu has been created to provide high quality classic dishes as well as our specialities with a twist. The setting at Cinnamon Lounge, Kings Langley, is different to any other. The 500 year-old building, one of the oldest on the High Street, features a grand inglenook fireplace and characteristic oak beams. The restaurant has been extended on the first floor to create a very contemporary ambience. The classic interior surroundings at Cinnamon Lounge Kings Langley is blended with a very modern menu delicately prepared by the team of experienced chefs.